ILAM, Oct 19: Dhan Bahadur Pakhrin is probably one of the busiest men in the locality these days. His wife Ramila is also in no less hurry. With the arrival of Tihar, which is considered a festival of lights and flowers, the couple is busy selling marigold and globe-amaranth they grew in their farm. The business, they say, has been giving them immense joy and good money. “When we talk of Tihar, what comes in mind is flower. 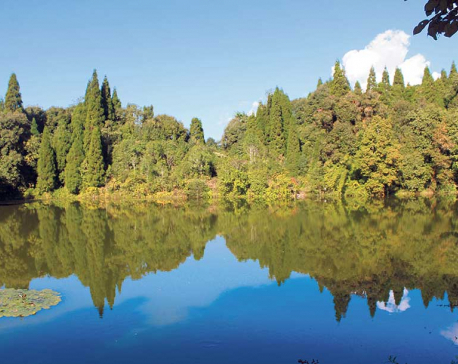 Without flower, it does not feel like Tihar,” said Pakhrin a local of Ilam Municipality-10. “Here in the eastern side almost everyone has flower garden and few buy it. But still we are doing brisk business as corporate house, other offices and travelers purchase it,” he added. The couple's house is located by the side of Mechi Highway and vehicles plying along the road stop by to buy flower bunches from farmers like Pakhrin. According to Ramila, they grow over a dozen types of flowers in their garden. However, marigold is the one that has high demand. “Many people are into flower business these days as it has huge market and scope. Though we grow several types of flowers, marigold remains always in high demand,” she said. “Some people exclusively want gold-amaranth for Bhai Tika. But, marigold is used for all purposes,” she added. Marigold is generally preferred for decoration as well as to make garlands. Pakhrin couple stated that they sell almost all their flowers within four days of the Tihar, beginning from Kukur Tihar (the day of worshipping dog). “We have grown marigold in two ropanis of land this year and we are thinking to expand it next year,” Ramila said. 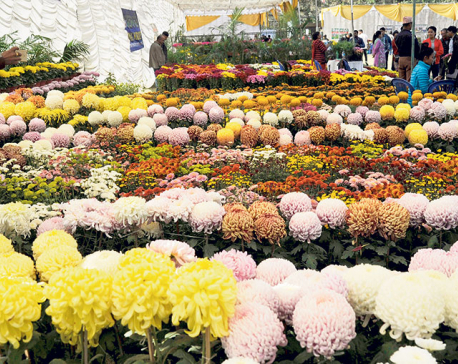 It is not just Ramila and Dhan Bahadur who are so passionately involved in floriculture. Dhan Bahadur's mother Bim Maya Pakhrin is also busy in her flower garden. She is excited that almost all the vehicle passing through the road have been stopping and buying flower bunches from her. “Almost all vehicles that ply through the road stop for buying flowers. One bunch of flower which has around 30 to 35 flower piece costs Rs 100,” Bim Maya informed. According to the Pakhrin family, despite growing interest of locals in flower farming, flower import from India remains high. “There is still huge scope for the locals in flower farming as traders continue to import massive amount of flower from India during several occasion,” Dhan Bahadur said.